Finally the Era has started in which World is considering India to emerge as the country with strongest Economy and development policies. Earlier the Brain Drain which made Top Indian engineers, doctors and scientists to leave the country and work in other parts of the world are coming back from THE DRAIN. What caused Brain Drain of our best Engineers and Doctors? 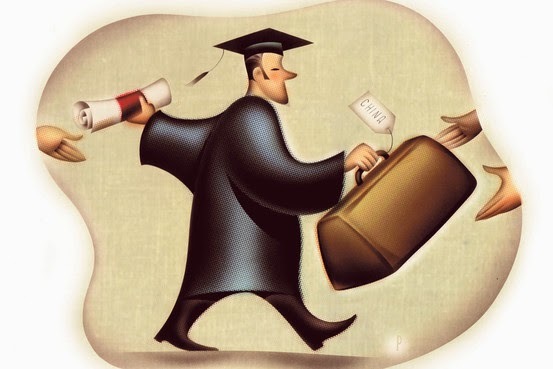 You will find it surprising but the professors of Deemed colleges encouraged the prospering students to pursue their careers in foreign countries by consistently ask them in which country they will be willing to work after graduation? "kyu bhaiya, khudka desh pasand nahi aata?" Indian Institutions just cannot stop selling the best labour to other countries who are already so advanced than us, can they? But well, now the time is having its call. No jobs in USA and many other countries for Indians now. Kya hua? Nikal gayi akkad? No matter how hard you try to leave India at first, you will always feel like coming back, as its your home, you will always be an Indian from heart. In many countries their native people are getting jobless as they do not pursue for higher studies and so the highly qualified Indian students acquire their job positions. As a result, many protests have been carried by the local people of several countries and Indians are thrown out of the jobs forcefully by the government to provide jobs to the locals. When asked to couple of NRI's that why did they left India to pursue jobs in foreign countries, all sang the same song. "No job opportunities in India, no proper platform, no recognition, no money etc etc." Inhe khete hain padhe likhe ganwar. whereas the recognition is considered As if they attain some noble award by migrating to foreign soil. If our government lacks in encouragement of opportunities that doesn't mean that you will fly to other countries. Now the foreign governments are throwing you out like anything. You and your neighbour are building a house, you are technically more qualified than your neighbour, but your neighbour is wealthy than you and building a bigger and better house. Will you stop building your own house and start working for him to complete his dream, expecting that he will let you stay in his house after it gets completed? That's what every migrant of India is doing, leaving their own dreams to complete dreams of other people who will throw you out once your job is done. It's our country and we only have to develop it. The Changing Scenario due to Reverse Brain Drain. Now the Indians who have migrated earlier to foreign countries are coming back as they feel the connection to their roots, a feeling of responsibility towards the nation and love for their families. The technical and perfectionists are returning to help their country with its future projects. As the country is taking stand against corruption, so to stay in India and develop in India. Those days are gone, in which we didn't had the facilities so that we had to go abroad to access to the new technologies. Today we have internet, distance learning programmes and every source to reach out to the best information available till date. The ones who are planning to migrate, I would like to ask them, Why if not money? Are we so easily sold out? Is money everything for you? There would be no such Indian who heard that India has reached Mars and didn't feel proud about that. India can do it, can do it in best way possible! All our country want from us is to STAY! Stay here and work on the new projects. Fight for the rights. Make your home a better place to live. Finally the migrated people are seeing potential in their own country after judging their stay at foreign soil. Finally India have an encouraging government which will support the growth of new entrepreneurs and the I.T. sector to blossom. Finally we are building OUR HOME. Its all happen because of knowledge, if we use our knowledge and wealth in right direction we were lead the world before 10 years ago itself.